Skimmers still kill fish, or pumps in the event of a leak, but there is a right way and a wrong way to install them. Their advantage - it's easy to get to the pump if there is a problem. It also does give a place to put an autofill securely. Pool filtration systems with a backwash feature, labelled for ponds. Great if you have time to backwash them. And if they are correctly plumbed so they don't lose prime. Expensive, and if you don't have time to backwash them, serious problems develop fast. Make maintenance easier but more necessary. Electrical follies: An extension cord you can see isn't that safe, but if the plug is sheltered from rain, and above ground level, it beats some very expensive and foolish things I've seen. Vertical facing non-gfci outlet below ground level. (and this was not a cheap pond). A pond pump cord hard-wired to an extension cord with frayed insulation under 300 to 500 pounds of rock. Cutting the cord off of the pump and hard-wiring it to an electrical source where no outlet is available. I don't know why people do this, but they do. Immediately voids the pump warranty - if you have a new pump with a 3 or 5 year warranty, we assume you would like that to be honored if the pump fails, with a free replacement if within warranty. Cut that cord off, and you'll be paying for the new pump. It is often cheaper to have an outlet installed, than to buy a new pump. Underground splices on outdoor wiring: guaranteed that sooner or later water will get into the pipe, if the splice is in a pipe. Guaranteed that a circuit will be tripped and stay tripped when this happens. If the pond pump goes out, always check the electrical with another household appliance, like a hair dryer, before buying a new pond pump. The electrical is the problem at least 25% of the time. And then there's the super cautious electrician or homeowner, switched outlets, switched outlets with the switch inside the house. But the worst - switched inside the house, but the pump is hardwired to the switch. Makes service on that pond REQUIRE the homeowner to be at home. We answer emergency calls as quickly as possible. Often we can tell you, by phone, what to do to temporarily rescue your fish until we can get there. Everything Fishy's telephone number is 817-293-1782. It is usually forwarded to my cell if we are on a job site. Our hours are essentially 9:00 a.m. to sundown during pond season. (March thru June) If we're out on a job you will get voicemail. Because cell phones are vulnerable to water damage, it can be a few minutes before we get the message. We are based in Fort Worth, Texas, and on annual maintenance we cover a pretty wide area, including McKinney, Plano, Frisco, The Colony, Denton, Weatherford. There is a mileage charge on visits over 30 miles from our base. 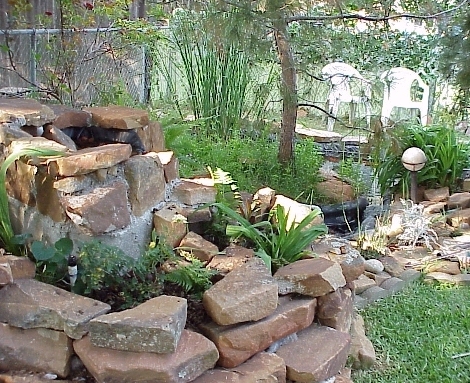 The Do It Yourself pond: Pond design tips to save you time, money and grief. Good filtration is critical to a healthy pond. Aeration helps to control temperature in the summer and enhance conditions for your fish, in addition to allowing many creative options in the way your pond appears, and sounds. The pleasant sound of trickling water, or the roar of a larger waterfall can be arranged. Bog and water plants enhance the ecosystem by using up nitrates. They also soften and naturalize the appearance of the pond. Water lilies bloom in the morning during the summer months, and provide shade for the fish during the heat of the day. We sell water lilies in several colors, pickerel rush, aquatic iris, water cannas, umbrella plants, parrots feather, and horsetail subject to availability. We raise our own plants. Other problems: Green water fed by the ample supply of leaching limestone. Cure for the green water and string algae: Everything Fishy's Ultimate Stone Sealant, available on the pond supply page. Requires draining the pond, powerwashing the stone, and of course the fish have to be elsewhere for a day or two during sealing. This relatively* non-toxic aqueous silicone solution penetrates the stone, blot up all excess product after first coat. 2nd coat needs applied 2 to 3 hours later, followed by blotting of excess and a 24 hour dry cure time. The second coat will bond with the penetrating first coat, and form an impenetrable clear seal, no gloss, no discoloration of your stone or mortar. UV resistant for about 2 years, then will require a re-coat, followed by blotting of excess and a 24 hour dry cure time. We've tested this product on several ponds with limestone, mortar, concrete and have had beautiful results easily verified with a simple pond test kit. 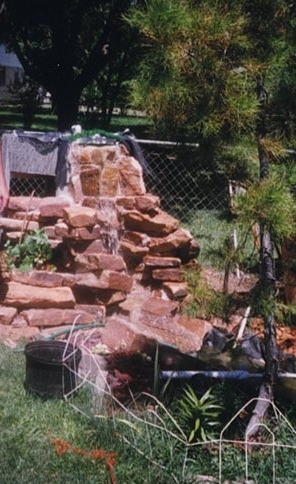 Test pH and alkalinity in your pond and water supply to know if this is your problem - both will be sky high on the pond, but not on the water source if stonework, mortar or cinderblock is leaching. After sealant, both will be around the same level as your water source. * relatively non-toxic compared to other sealing products. If a drop or two gets in the pond water the fish will not all die. Large water flow volume in a very fast moving waterfall is NOT the only answer if filtration is the goal. but with proper filter height, a good flow helps. 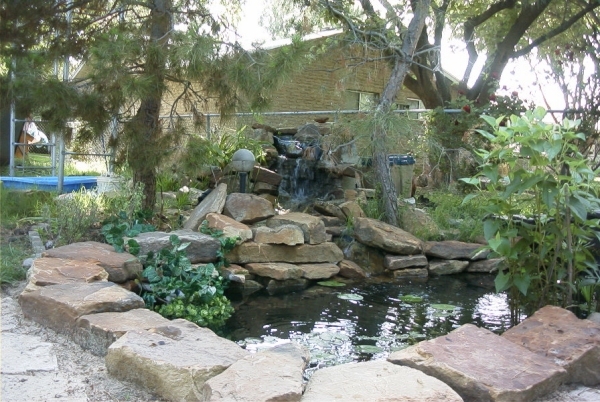 Pond design services are available whether we build the pond, or you do. Generally, we try not to build anything we wouldn't want to service. Good results require good quality materials. Everything Fishy handles only 45 mil liner on a per order basis. We handle only the best pumps, and we build a few of our own filters. We also sell selected filters by major manufacturers. 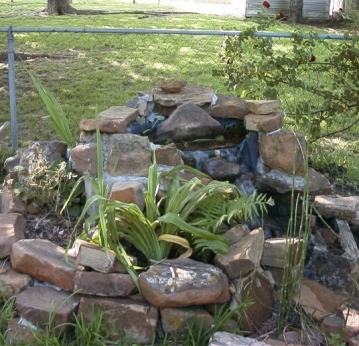 Pond Design Tips: Or how NOT to build a pond. Experience is a marvelous, but expensive teacher. Rule 1: Bigger is better. Especially if you are going to dig a hole in the ground, you want to map the area and determine final size you will be happy with before you start. Then call 811 or 1800 DigTess and have them look for buried electrical and gas lines. This may sound unnecessary, but one buried line can cause some really big problems. And on too small, let me share a story. 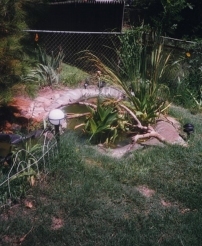 My original pond, (April 1993), was intended as a breeding area for toads, and home for one betta. It measured around 84" from end to crescent end. It was positioned between 2 young eldarica pines, which don't have a dense conical shape, but grow airy and free-form in Texas. The red lines represent fence line. Spring 1993, (or very early 1994), pre-pond. 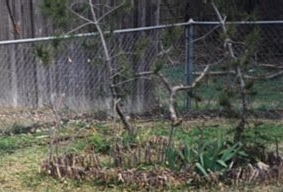 Twig fences to keep dogs out of flowers and young pines. My husband walked out the back door a couple of weeks after I dug it, and said, "That's not a pond." By this time the ground had packed in well, the dirt I had removed was distributed around the foundation, and it was too late to go back to just grass between those trees. The evaporation rate was so high I was adding water with dechlorinator twice a day. On July 4, 1995, my kids and I got home from the parade to find an ambitious man with several shovels. The next phase of the pond was dug that day. The original crescent became the runway for the waterfall he was going to build. 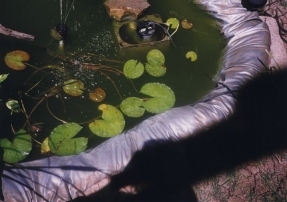 The liner for the main pond was an old waterbed mattress, since we were still building. The following photos were taken in June 1996. The original basin for the water fall was too high to be rocked in without several tons of sandstone. Eventually the legs would be cut down and it would be lowered to its current height. The area underneath was filled in with packed dirt. Sandstone, concrete and mortar shift as they age. Leaks develop and water ends up under the waterfall. Water under pressure leaks more than standing water. A lot more. May 1996 photo, last substantial changes in July 1995. 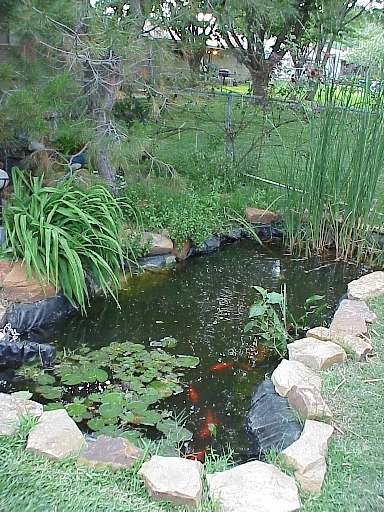 After the 4th of July enlargement and re-line, the pond held around 125 gallons. We kept gouramis in it because they could tolerate the heat of a Texas summer with sporadic filtration. 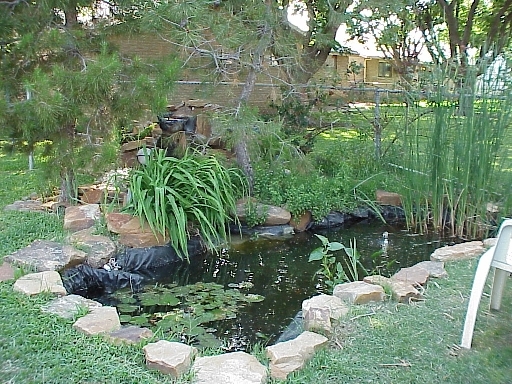 The cattails were added (not shown on diagram above), followed by water lilies, to provide shade for the fish. I added about 50 gallons of water a day to make up for evaporation on sunny days. The blue and gold gouramis actually thrived on the heat and got beautiful color from eating mosquitoes and larva. I still have some of these fish. Of course I had to get in the pond and catch them before winter arrived, and the one that got away didn't survive the first cold snap. Gouramis are intelligent. The smartest one must have hidden in a fold of the liner, because I drained the whole pond and didn't find him. The pond stayed at 125 gallons and in this configuration for the 2 years it took us to complete the main falls, working a weekend every 2 or 3 months, as we had time. We ran gouramis in the summer and goldfish in the winter. The goldfish didn't adjust to leaving the pond as well as the gouramis. I was all set to give them to the neighbor kids for fishbowls, but one night in a fish bowl and they all died. I believe it was the shock of leaving the dark hidden winter pond. 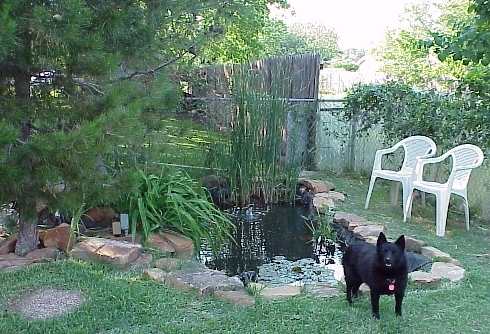 Photo: Our pond, summer 2000, before we started the next series of revisions. After the enlargement and deepening we did in 1997 and 1998, we could leave the goldfish in all year. Why not koi? Snack food for water snakes and water birds should NOT be expensive. AND Koi eat plants, have no growth regulating hormone, and outgrow the pond. The goldfish get quite large, and do not eat the plants. At this point it started to seem worth all the work. It isn't finished. Eventually we will have covered all of the exposed black liner. Our pond ends up in line behind our customers' ponds, which is appropriate. We are laying a light gray flagstone over the area where the chairs are in this photo, and an upper plant basin with a 2nd falls has been added in the corner of the fence. (2 or 3 weekends pouring concrete walls before we lined it and got water in it.) 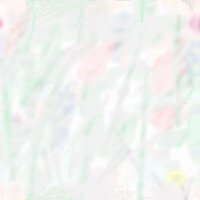 It is now full of plants, bog plants, young bog plants, and young lilies. The 4 bullfrog tadpoles I bought this spring have turned into at least 2 young bullfrogs who are quite amusing, and will be quite loud one day I'm sure. But living in the city doesn't suit us. Bullfrogs sound like country. New photos with the results are below. To lay the flagstone we had to pull all of the sandstone at the edges off, dig out the grass and dirt down about 2 inches, and level with sand. As a consequence, the area around the pond looked pretty bad for a couple of months. Summer 2000 photo, falls from back, view into corner where plant basin will go. One last look before we started stripping off grass, and rock, and removing edge plantings. Pond revisions can really wreck a back yard. 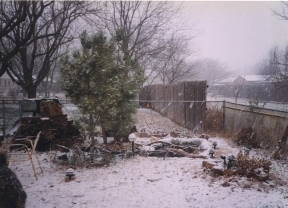 Have your outdoor social schedule cleared for at least a month if you have large plans. Finally all of the leaks are sealed. A single piece of liner from top to bottom wasn't an option without hiding stone work, so fiberglass has been used to seal the entire water-bearing surface on the front of the falls. We're down to losing a half inch of water a day to evaporation, but this is May. In July we will lose more to evaporation, but no more water under the liner. The entire runway was sealed with fiberglass, where the dog toenails had made tiny punctures in it. But the real leak was a pressurized crack in the rock on the main falls. If liner had originally been built into the design, behind the rock, this wouldn't have happened. But the Ponder's Bible hadn't been written when we built the falls. Upper Plant basin: concrete walls poured between plywood framing. No bottom, lined with a 10x10 pond liner. It's bigger than it looks. 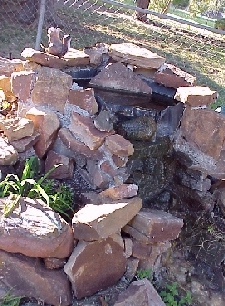 Falls into the pond splash over stone that rests atop 45 ml liner. Solid, loose, unglued overlap. It doesn't leak. The pump is hidden, the pipe is hidden in the main pond now. Perennial hardy plants are going in below the lonesome pines. The pines are now 10 ft tall. Compared to the 1995 and 1996 photos we scanned tonight, this place has grown up. Grass has just about disappeared from this corner of the landscape.Still plucking a litttle out between the stones. This pond was freshly scrubbed about a week before these photos were taken. It was totally green, full of stringy algae rooted in the liner prior to the cleanup. 2011 UPDATE - we found a cure for green water and algae growth due to contact with concrete, limestone and mortar. We use an aqueous silicone sealant (surfaces must be clean, pressure washed first) See more details on the Algae page or if you want to buy it and apply it yourself, check out the pond supply page, scroll down to item 1435. You'll need to empty your pond, pressure wash, and you will need a pump sprayer that has not been used for pesticides. After 2 coats of sealant, with a couple of hours between, let cure and dry for 24 hours. Caulk any large cracks with a pure silicone caulk - no fungicides - AFTER applying the sealant, or just foam the cracks, but I would seal first. Order, email or call if you have any questions. We have had great success with this. 1. Have a plan. Know where all pipes and buried cables are in your yard. 2. Know where electricity for the pond will need to be, and where it will need to come from. Most cities require cable to be buried 12 inches below ground. Gray PVC around single strand wires of the appropriate weight are the easiest and safest to work with. Match the circuit breaker your electrician will be adding to your outdoor requirements. 25 amp is generally OK for a pond pump and submersible lights. If you plan on (or have) a pool or other large electrical devices, talk to your electrician before doing anything. Once the breaker is selected, match your wire to the breaker. Your GFCI outlet should be mounted above ground and above possible flood zones. Hidden behind a shrub is fine. We generally dig the trench, run and connect the pipe, and run the wire through it, then have an electrician complete the installation. 3. Have the liner ready before you start digging. Just in case mother nature sends a downpour. 4. We place the rim of the pond slightly above ground level (about 4 inches). 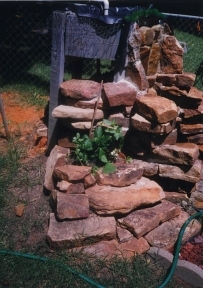 This prevents runoff from the yard from ending up in the pond. 5. An overflow can be a fish saver. If too much rain falls, it's nice if the fish are still in the pond in the morning. It should be placed an inch or so below the absolute top rim of the pond. A bit of pvc pipe or a fold in the liner between 2 stones will do, on the downhill side if your yard isn't 100% level. 6. Plumbing: The best place to match up the pieces is at the hardware store. Fittings, hose, and pump all need to connect correctly. We carry flexible non-kink hose on Everything Fishy. Hose is generally measured by inside diameter, and should fit very snugly over pump outputs or fittings. Corrugated flex tubing cracks and breaks faster than smooth vinyl flex tubing. Flex PVC (spa hose) requires pvc fittings and should never be clamped. You'll need primer and blue glue for it. 7. If you build a waterfall, put it at a corner of the liner so the liner can extend up into it, under the rockwork. This may prevent leakage problems due to rocks shifting, children, dogs, etc. As long as the water gets back into the pond everything else can be fixed. 8. Avoid glue-dependent situations. Buy a liner that is large enough, rather than piecing 2 sections together. It's more expensive at the beginning, but most submersible glues do not hold up for more than a year or two. 9. Buy or build a good filter. A low flow gravity drain filter is the easiest to work with, and often provides the best clarity and water quality. It is also one of the least expensive. Everything Fishy sells a kit. Cyprio and Hagen make reasonably good filters. Identify a gravity drain filter by its spraybar. Water comes in at the top, and goes out thru the bottom. They do have to sit above water level and cannot be used to drive a waterfall. But they are less prone to pressure leaks and backups, and far easier for a home-owner to maintain. 10. Buy a pump slightly larger than you think you need. Use a T or Y fitting to divide some of the flow off for circulation, a fountain or a falls Use a PVC or other good ball valve to control the flow going into the filter, and elsewhere. That's a start. Mistakes, ours, and some we've seen, are listed below. 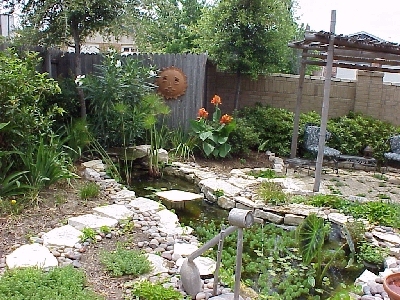 There are many ways to put together a beautiful pond to enjoy. Ours are custom-designed to a large extent, to suit our customers' requirements. But the tips above are always taken into account. We made a lot of mistakes building our first pond (in our back yard) in 1995. But since we knew we'd be taking care of it ourselves, we never had the disasters we've seen in ponds built by landscapers and contractors. All of the filter systems we avoid are expensive, some of them keep the ponds clear. Ponds have become big business. Everybody wants a piece of the pie, but bad builders are here today, gone tomorrow, when you need them most. Everything Fishy is an aquatic design, construction and maintenance company. 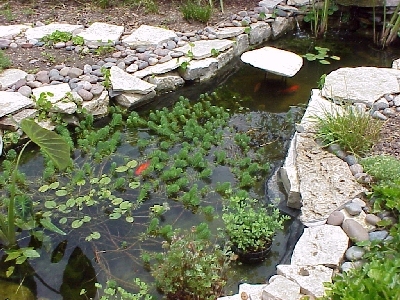 Everything Fishy would love to design or re-design the landscape around your pond, choosing plants suited to soil conditions, weather, and those that won't litter the pond with debris. 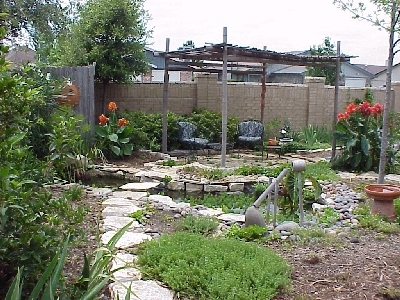 Ask us about our landscape services in the Dallas-Fort Worth (Texas) area. 817-293-1782. 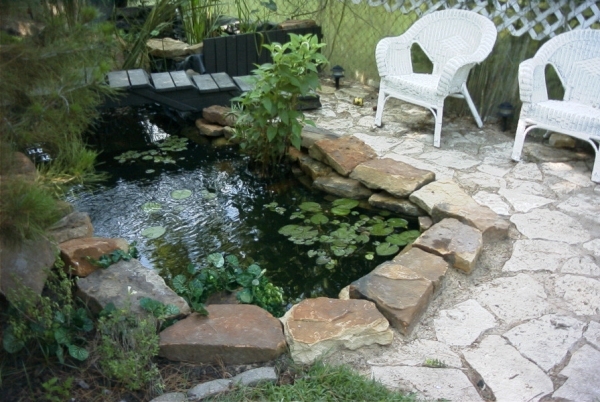 We also do consulting for do-it-yourself pond and landscape customers. Pond photos. Unsealed concrete, mortar, concrete "cinder blocks" holding plants up. On exposure to pond bacteria and carbon dioxide from fish and bacteria, all of these leach carbonates and lime into the pond, feeding very tough algae problems. Aquatics information, photographs, articles Copyright © 1999 - 2018 by Alice Burkhart, All Rights Reserved. July 2000, before the upper plant basin, rockwork redesign, and while the falls still leaked a bit.